At the irido-corneal angle (angulus iridocornealis), the trabecular meshwork of the pectinate ligament (ligamentum pectinatum) spans from the scleral trabecular network where the sinus venosus sclerae lies to the base of the iris and the inner leaf of the corpus ciliare. The pectinate ligament encloses the spaces of Fontana (spatial anguli iridocornealis). 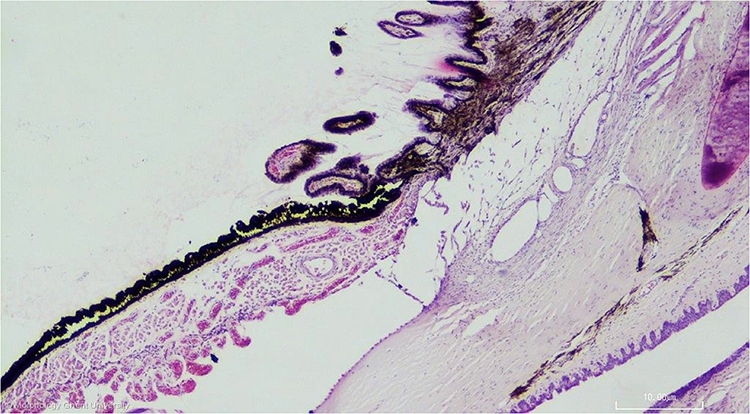 The pectinate ligament consists of elastic fibers, covered by a simple squamous epithelium.